My family and I rented It's a Shore Thing for spring break. Most of them have never been to the beach. It was the perfect experience for them. The property was close enough to walk to the pier and spacious enough to comfortably accomadate us. I would recommend this property to any big family. After a month here we are saddened to have to leave your beautiful home. The floor plan is outstanding, the views exquisite, and the sand and surf literally at your backdoor! It was just me, my wife, and her sister staying here, but we did have guests visit us. We were able to accommodate them comfortably. My children bought me a metal detector before we came and I had a blast on the beach and a nearby park. The women enjoyed their morning beach walks and of course "shopping." Pier Park is a stone's throw away and the area has everything one could need. We would like to thank Natalie at Century 21 and especially the owners of this wonderful property. We tried to treat your home as we would ours. Thanks for sharing it with us. The property is a "Shore Thing." Perfect first class place. Our family fell in love with this house. It is right on the beach and had a fenced yard for our poodle. We have stayed in serveral places over the years and this is one that we will stay in again and again. It is a truly a private oasis. Our family spends Christmas at the beach every December. We have had some bad experiences with homes not in good working order. We were delighted to find a house that is well-maintained and so thoroughly managed. I knew the minute I walked in that this was the ONE! Our property manager was excellent and the hospitality staff (Missy) was wonderful. Absolutely the cleanest house we've ever seen. The location is ideal for our young family members who want to tour the area. As for my husband and me, we'll just hang around the many deck options and watch the waves roll in. Thank you so much! We had a great stay at "It's a Shore Thing". The house is very nice, updated and clean. It is very spacious and it's in a great location. There's nothing like walking out of your bedroom onto the balcony to watch the sun rise over the gulf. We will definitely be staying here again. We had a group of 9 ladies stay for a weekend and it could not have been better . The house was flawless! The location was amazing. The house was decorated perfectly , everything was so cute, and clean. Nothing was old or worn out looking . It was fresh, stylish and done in prefect taste. The pictures on the listing are good, but it is even better in person. We loved that there were plenty of beds and bathrooms, no one was forced to sleep on a pull out sofa and no one had to wait for a bathroom. There were plenty of towels to use and extra blankets. The booking process was very easy and hassle free and it was always easy to get in touch with someone. The only thing we hated was having to leave. We all said we would love to come back again , and would for sure stay in the same house. Where do I begin! Twelve of us came here for a Labor Day girls weekend trip and had a blast! This house was AMAZING! The owners thought of literally everything. The pictures on the website do not do this house any justice at all! The owners were doing some renovations the week of our arrival, new fixtures, new carpet, etc. It was emaculately clean and spacious! We had everything and more that we needed in the kitchen. There were plenty of towels, washcloths, and handtowels. There were also fans in each closet of the bedrooms. The three decks were a nice touch. This house sits right on the beach and has a gorgeous view of the beach. There was plenty of seating inside and outside for everyone to enjoy and be comfortable. I loved the fact that there is a private walkway down to the beach and it's not a very far walk at all. And I love the fact that the owners installed a shower and hose outside so people could rinse off before walking into the house. This house is walking distance from Pier Park and there is a Dusty's right across the street. There is also a Winn-Dixie close by. The ONLY thing this house needed was a pool however, there is an Aquatic Center about 5 minutes away with a nice pool. I would definitely recommend It's a Shore Thing to others and would definitely come back and rent again! Whoever the owners are, kudos to you because you did an excellent job on this house! Well worth the money! We loved this place. It was very clean, nicely updated. We had a pool that was very close. It was about a 3 min walk to the beach. Everyone that we met was very friendly and the resort is gated so we felt safe. The resort is in a great location. We will stay here again. I stayed at this lovely beach house with my extended family of 9 the first week of May 2015 and LOVED it! The home is beautifully decorated, well kept and no details were overlooked. Kitchen is fully stocked, bedrooms are spacious and storage isn't lacking. All nine of us lived comfortably together in this house for an entire week and never felt stressed or cramped. The backyard is an oasis and the hot tub was a lifesaver on the nights we didn't want to go out, but didn't want to waste the perfect weather watching TV on the couch. Oddly enough, the clothesline was our favorite detail! It was great having a place to hang dry all our wet swimsuits, beach towels and water shoes. The house sits two blocks from the beachfront, so the golf cart was wonderful! We only had to use our cars when we were going further than a few miles, but the golf cart allowed us access to most everything we needed, including restaurants, liquor stores and even Dollar General. The home sits on the corner and there are currently no direct neighbors (lots to each side of the house do not have homes on them), so we had a lot of privacy and little noise. We had a few minor maintenance issues arise during our visit and maintenance showed up within hours of our call to make repairs. Fantastic! My only complaint, if you'd even call it that, was that extra toilet paper, hand soap and trash bags were not provided. We ran out of the one roll of toilet paper per bathroom, paper wrapped bar soap and two trash bags by day two and had to purchase new packages of all these things, which we ultimately left behind in the house for the next guest as we did not have room in our vehicles to bring it all back home with us. Bring these items with you when you stay! You can NOT pass up this deal! I would stay at this house again and again. We loved this property's close proximity to the beach and Schooner's. It was perfect for a girls' weekend in PCB. The rooftop deck was awesome. Our family had never vacationed in FL before and after this stay we can't wait to come back! The condo was well appointed, a previous reviewer stated there were no toiletries and that was not the case for us. There was dish soap, paper towels and toilet paper, even shampoos, soap, and conditioners in the bathrooms. The condo was very comfortable for our family of 6, it's especially nice to have 2 king beds. It was Spring Break when we went but we had no issues at all. The elevators didn't take long, no loud parties, or anything like that. One of the things we loved was that it's not a huge complex of condos and the heated pool of course. Also we saw at least 2 security guards at all times so we felt pretty sure they would have any issues under control pretty quickly. 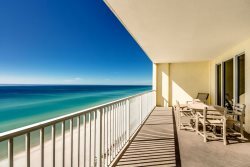 People have always told us Destin was the place to go but we visited Destin during our stay and we actually prefer this section of Panama City Beach. It wasn't as big or as crowded as Destin but it still has a lot to offer. We can't wait to go back! This is a beautiful home with a lot of room. The pictures are exactly what you get. The location is wonderful. There are plenty of things to do within walking distance. We had a group of 18 year old girls and we were close enough to the Spring Break chaos for them to experience it but just far enough away where we could control it. Everyone had a wonderful time and I would highly recommend the property. I would love to take my family. Lauren and everyone with the management company were very helpful and great to work with. I rented this home, for the entire month of February, to share with my 87 year old mother, so that we could escape the bitter Michigan weather. We totally enjoyed our stay in this property. The two bedrooms we used were on opposite ends of the house, both with their own bathroom, which provided us with added privacy. My Irish Wolfhound loved the back yard that she could roam around in at leisure. We ate in most every evening and the kitchen was well stocked, with the necessary dishes and pans for successful meal preparation. The location was convenient to the whole of Panama City Beach and Panama City. The furniture including the beds, was comfortable and the decor was warm and inviting. My mother enjoyed the use of the golf cart to view the neighborhood and go to the beach. We would not hesitate to rent the property again should we come back to the area and it were available. Kudos to the owner and the property management company for making our stay pleasant. This unit was nothing but 1st class all th way around. High dollar furnishings. We have traveled the world and never have had a view like this Penthouse offers. So clean and the beach is quiter off Thomas drive than Front Beach Road!! We will be back to stay at this 3000 square foot unit again. Thank you for sharing this beauty! this CONDO was unreal to even be true. We enjoyed this trip more then any that we have been on, even cruises that we have been on,this was a really nice place to go and relax, once we got there we did not want to go anywhere to see Panama City. WE could sit on the balcony all day and enjoy watching the water and people on the beach. we did have to leave but there will be next year. This place is just absolutely amazing, can't wait to spend many more vacations here! This is a great getaway and it makes you feel like your at home! We chose this home for several reasons to celebrate our daughter's 18th birthday. It totally exceeded our expectations. The home was clean, well maintained, spacious, and had the perfect "beach" feel for all 11 of us that stayed. The kitchen was awesome and stocked well with dishes, cookware, etc. The decks were perfect for drinking morning coffee and hanging out in the evening. The location of the house was exactly what we wanted - privacy, but just a 5 minute walk to Pier Park which offered shopping, restaurants, movie theater, ice cream, coffee...As a group, we enjoyed Pompano's at Pier Park and the Beach Party appetizer is recommended. The white, sandy beach is only a few yards away from the house. Just down the beach, our daughter and her 2 friends went para sailing. On Saturday, we traveled a little over an hour for a Dad/Daughter sky diving adventure. The location of "It's a Shore Thing" was convenient for everything we planned. We have already recommended this wonderful home to friends and family and plan to return. We are so appreciative to the owners for sharing their awesome home and to Lauren for her professional and hospitable customer service. To put it in the words of our 18 year old after her sky dive, "It was a perfect landing". My husband and I stayed there in July last summer. The property was so clean and had a lot to offer to there guests. Overall we loved everything about this property including the outside experience with the pool, grill and radio surround sound. Our boxer loved being able to sit outside with us all the time while we were swimming. Best Florida rental that we have ever stayed in for the last 10 years!! We hope that we will be able to go every summer and stay here! Book PCB or century 21 was very easy to deal with and I would remind them to anyone!